Oh, Netflix rom-coms, what strange joys you have brought into my life. My roommates and I have built several running jokes around quoting Jenny’s Wedding (2015) and how it uses “She Keeps Me Warm” in two different scenes in wildly inappropriate ways. My Santa (2013) is a beautifully incompetent holiday movie perfect for drunk watching. 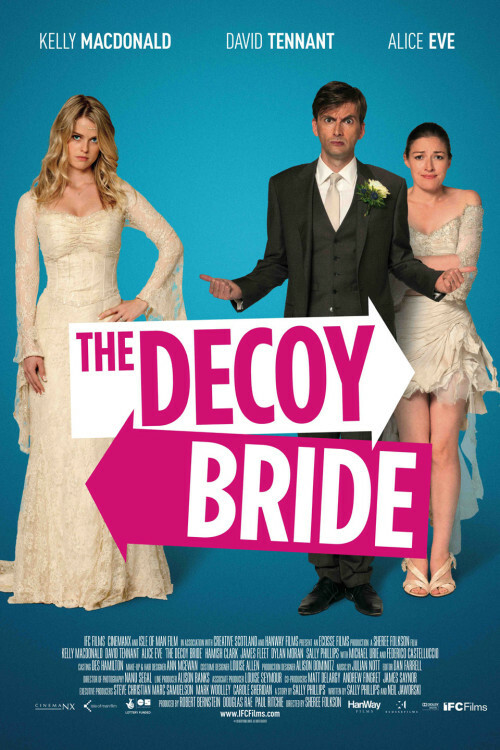 And now, browsing through cheap rom-coms has brought me another bit of inane fluff to enjoy: The Decoy Bride (2012). The film 100% roped me in with two names high up in its billing: David Tennant plays the romantic lead, a nebbish author engaged to a movie star, and Dylan Moran plays a tabloid editor who I assume had a bigger role in an earlier cut of the film, considering he has two major scenes that seem to set-up a subplot that never manifested. Tennant’s character and his fiancee are hiding away on a small Scottish island to keep their wedding out of the limelight, and a local woman named Katie, played by Kelly MacDonald, gets roped into serving as a decoy bride in a fake wedding to throw off the press. She and Tennant get stuck together, rom-com tropes ensue. The Decoy Bride isn’t bad because it’s fluffy or trite. It’s bad because it’s poorly put together, and the gaps make the fluff not hold together as well. I can see the ghosts of at least three earlier drafts in the script: one where Dylan Moran’s character had a bigger plotline, one where the fiancee had a meaner edge, and one where the star’s agent doesn’t disappear halfway through the film. The leftover script fragments leave the film very uneven and scattered, and the slap-slap-kiss development between Tennant and MacDonald does not have enough time to develop into something worth leaving a fiancee at the altar for. They have some chemistry, and I could watch David Tennant read a phone book, but not enough to bring together the gaps in the script. The best moments in my mind are when it goes fully into cheese. A sequence where Tennant is stuck in a 70’s trendy bagpiper outfit, a collection of scheming old people trying to sell handicrafts to tourists, MacDonald making fun of the gift bags from the fake wedding, those are all cute moments. They just need a more secure script to hold them together. It’s cute, it’s dumb, and it grossed $759 across its entire theatrical run. That about sums up a trashy movie in my mind. Would I Recommend It: Ehhhhhh…if you need some absolute brain candy, there are better and worse films out there. A lukewarm yes.